At 14 per cent, Saskatoon’s rental apartment vacancy rate is at a level that might spur Vancouver or Toronto’s embattled renters to consider quitting their jobs and moving to the Prairies. The continuing high vacancy rate is also pushing rental rates down almost in lockstep. “Tenants now have options,” said Duncan Mayer, research manager with Colliers International Saskatchewan, which recently published a report assessing Saskatoon’s multi-family property market. The report says the purpose-built apartment vacancy rate in the city is 14 per cent, down slightly from the 2015 peak of 18 per cent, but still remarkably high (consider that Vancouver’s purpose-built vacancy rate is around a critically low one per cent). Rents are also down about 14 per cent. That’s a reduction of more than $150 per month for a two-bedroom unit in the city since 2015, the report said. A series of factors have led to this ongoing apartment glut, a major turnaround for a city which was one of Canada’s fastest growing urban areas just a few years ago. 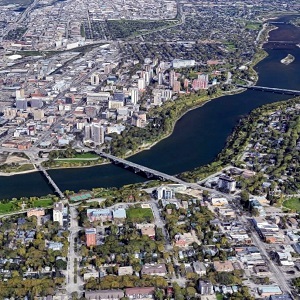 Saskatoon’s population grew by about 11 per cent from 2011 to 2016 according to Statistics Canada — virtually all of that number in the first few years of the decade. Now, the Saskatoon multi-family market is going through a transition. “In 2016, we reached a vacancy rate of about 18 per cent, citywide, which is pretty much unheard of for the last decade,” Mayer said. In 2014, Saskatoon’s apartment vacancy rate was around four per cent, he said. Saskatoon’s rental market has always been closely tied to the unemployment rate, which has been climbing since 2013 and now touches nine per cent. During the resource boom from 2005 to 2015, Saskatchewan had the highest median household-income growth among Canadian provinces, according to census data released last year. However, then times got tough. Mayer said lagging commodity prices have been the main culprit for a lack of housing demand. “Unfortunately, nearly all the commodities that we’re reliant on are in a down market at this moment,” he said. Potash reached $1,000 per tonne around the end of 2009, stoking the provincial and local economy, but those prices started to fall in 2013, he said. “There just hasn’t been a recovery in that market, and as such, the economy is sort of stalled for the moment,” he said. Saskatoon’s apartment vacancy rate remains among the highest, if not the highest in Canada, said Tom McClocklin, the president and managing director of Colliers in Saskatoon. “We went from almost no new stock to a significant uptick, and that all happened at the same time the mining sector hit its downturn,” he said. “Apartment rental rates have actually come down, which is something we’ve never seen in history. The city’s supply of rental housing is also part of the equation. In October 1990, there were 19,414 purpose-built rental units in the Saskatoon market, according to Colliers. That number fell to 13,790 units by 2008 due to the effects of a wide-scale conversion of rental apartments into condos. Then, from 2010 to 2018, more than 1,491 units of purpose-built multi-family entered the market with an additional 172 units now nearing completion. The new inventory spurred a flight to quality for tenants eager to enjoy new buildings with better amenities, premium finishing and better parking — and mostly at similar rates to what they were paying for the old apartments, Mayer said. He said the average asking rate for a two-bedroom apartment is now $1,084. “That might continue to trend downward,” he said.